A few years back, I visited the island of Bonaire, in the Dutch Caribbean. The island serves as an example of what can happen, when conservation takes the forefront, and is used as an engine of economic development. In 1976 the late Captain Don, (proprietor of Captain Don’s Habitat) realized that Bonaire’s most valuable resource lie not on land, but underwater. The island was surrounded by beautiful coral reefs, and the western side of the island rarely got dangerous oceanic conditions, making it perfect for scuba divers. The captain worked with the Dutch government, and a reef preservation program was put into place, and today the rest is history. Coral reefs around Bonaire rank as some of the most beautiful on planet Earth, and are home to 90% of all species that dwell in the Caribbean Sea. Massive populations of squid, octopus and tarpon are common sights, and the reefs are famous for macro sea life as well. 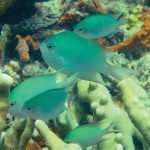 As aquarists who focus primarily on fish and coral species from the world’s other side, it’s easy to forget the beauty and diversity of the Caribbean Sea. While diversity in the Caribbean pales to that found in the South Pacific, or around Indonesia and Australia, it is certainly breathtaking. 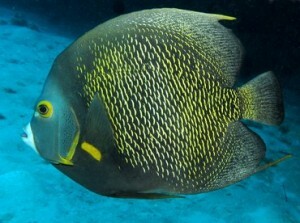 Many of us have had a Caribbean reef tenant or two, perhaps a queen angelfish, or red tailed triggerfish. Though, it’s rare that I stumble upon a Caribbean Sea biotope aquarium. 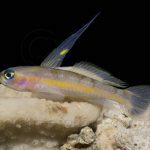 It’s easy enough to toss some Caribbean species in, with species from other reef ecosystems, but consider a tank dedicated to this unique ecosystem. For those of us on the east coast, the Caribbean isn’t a world away, and usually a 5-6 hour flight can have you exploring unique islands like Trinidad and Tobago, or hopping through the ABC islands of Aruba, Bonaire and Curacao. To keep a Caribbean biotype, there are a few things to consider. First, the Caribbean is usually a bit warmer than pacific oceanic regions. It’s not uncommon for water temperatures to reach 85 degrees, starting in areas like West Palm Beach, Florida, ranging down through the entire sea. While visiting the Bahamas in 2011, I was shocked that water temperatures had exceeded 87, which dive operators found to be unusually high. In the aquarium, it’s advisable to replicate this higher temperature, and since Caribbean islands have the same winter/summer patterns as North America, you can adjust temperature accordingly. Small, incremental rises occur in the summer, and as winter sets in, the water gets a bit cooler, dropping down to around 75 degrees. Replicating this natural cycle in the aquarium, works well to re-create the changes which occur in the Caribbean, and replicate the natural cycles of your tank’s inhabitants. 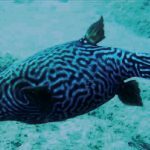 Some of us are unaware what species of fish originate from the Caribbean. I’ve found a notion among aquarists that the Caribbean Sea is limited, in what it offers diversity wise. When you consider that one of the fish that hails from this region, is often considered one of the most beautiful marine fish, the queen angelfish, it’s easy to overlook some of the unique and jaw dropping creatures from the Atlantic’s tropical conjoined twin. 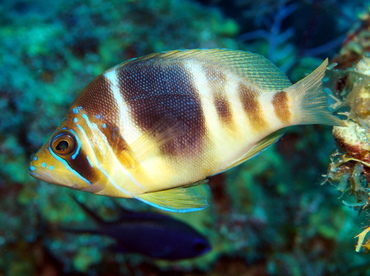 One gem from the Caribbean is the barred hamlet, Hypoplectrus puella. 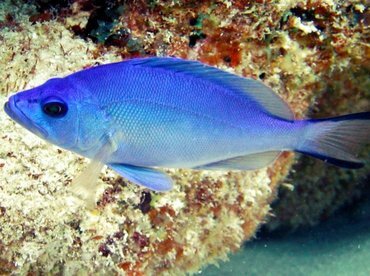 These small reef dwellers rarely exceed five inches, and on wild reefs, they inhabit shallow waters, ranging from ten to 50 feet in depth. They are unlikely to bother corals, but they do have a lot of predatory instinct, for such a small fish. Hamlets will eat specimens small enough to ingest, and may bother tiny invertebrates. Since they remain so small, it’s limited in the amount of damage that they can do. Barred hamlets are quite striking, with a bright yellow body highlighted by neon blue. If more color is what you’re aiming for, the blue hamlet is solid neon azure, and shares the same size and habits as the barred hamlet. The indigo hamlet looks almost like a freshwater frontosa cichlid, with bright sapphire matching a dark blue and white. It’s surprising we don’t see more hamlets in marine aquariums, as they really are fascinating fish, and quite easy to keep. 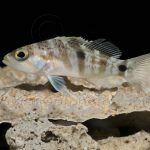 They can be difficult to find, as many suppliers don’t stock them, mainly since they are rather inexpensive, and the demand for Caribbean aquarium imports isn’t tremendously high. 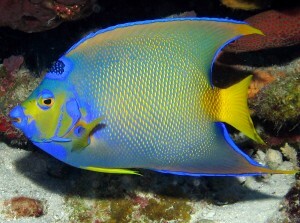 Another often overlooked, yet beautiful Caribbean native, is the blue angelfish Holacanthus bermudensis. 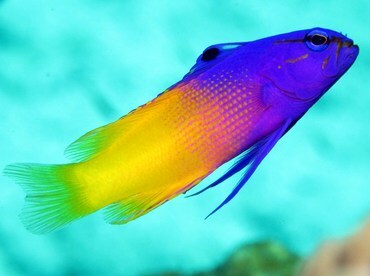 Some divers and aquarists, mistake this brightly colored species as queen angels. They don’t have quite the color as queens, but blue angelfish are gorgeous in their own right. They are hardy, but grow large and require a lot of swimming space. Also, blue angels, like their queen cousins, are notorious color pickers, so devastating they cannot be recommended for a reef environment. Another rarely seen Caribbean angel is the French angelfish Pomacanthus paru, one of my personal favorites. This species trades vibrant color for overall uniqueness. It’s nearly black, with bright yellow edging on each scale. 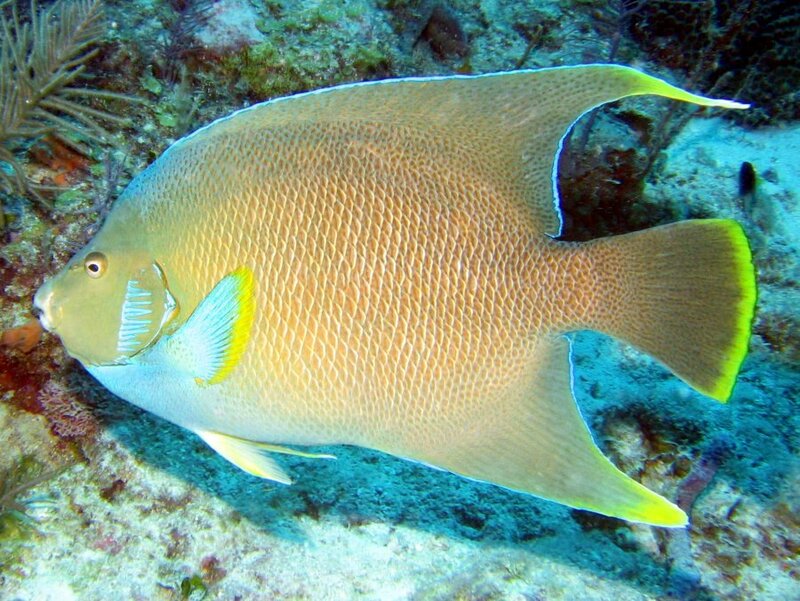 These fish grow to a massive size, and seeing a French angelfish, well in excess of one foot, cruising along a Caribbean reef has kept me returning to dive sites throughout the sea for years. Like other Caribbean angels, the French angelfish consumes coral and grows large, so it’s best suited for a big, fish only tank. Juveniles of this species are almost more striking than adults. They pose as toxic nudibranchs, and are jet black with bright yellow lines. Watching the transition from juvenile to adult makes keeping this species something that is excitingly different. 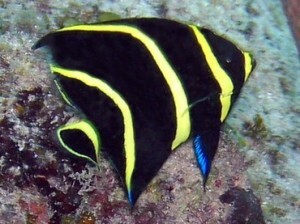 The queen angel is hands down, one of my favorite marine fish. Seeing a group of these on a wreck off of West Palm Beach, Florida, helped solidify the reality that diving was going to be an integral part of my life. Their care requirements mirror other Caribbean angels, and I can attest from personal experience, these fish are ruthless coral pickers and get massive. 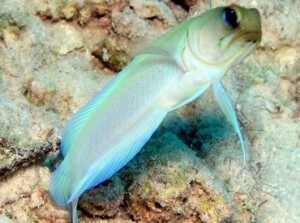 A popular Caribbean species often seen in home reefs is the yellowhead jawfish of the family Opisthognathidae. Inch for inch, these little guys might be the hobbies’ most personable fish. They require a deep sand bed in which to construct a burrow, and are known to blast sand over nearby corals. Meaty fare makes a good diet for these hardy tenants, but a tight fitting lid is a must. Jawfish are notorious jumpers, and without a tight fitting lid, it’s simply a matter of time until you will find a shriveled up carpet surfer. The royal gramma is as common, as common gets, in marine aquariums. Nearly every aquarist I know, has at one point kept a royal gramma. They are excellent beginner fish, and tolerate a range of imperfect water conditions. These are just a few great fish from the Caribbean region, and there are literally many, many more. Many species found in the Caribbean, are not suitable for home aquariums. Fish like the great barracuda Sphyraena barracuda, lookdown Selene vomer, and even the green moray eel Gymnothorax funebris grow large and have difficult (and expensive) diets to replicate. Anyone who has visited a Caribbean reef, is sure to remember the mix and match of species, when it comes to sessile invertebrates. 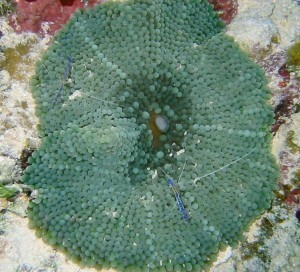 Reefs in this sea are often covered with sponge, gorgonians, corals and sea squirts, all on the same tiny patch of reef. It’s replicating this, which truly makes a Caribbean biotope feel authentic. There are well over 30 corals recorded in the Caribbean Sea, two of which remain on NOAA’s threatened species list, and are illegal to import or keep. One that can be kept is often called the feather black coral Antipathes pennacea, but has more in common with a gorgonian. This is a non-photosynthetic species, which requires expert care and feeding. Appearing bright red under a dive light, this species shines in the home aquarium, and creates the perfect complement for bright Caribbean fish. Symmetrical brain corals Diploria strigose and grooved brain corals Diploria labyrinthiformis are hardy LPS colonies from Caribbean regions, which create an interesting conversation piece within the aquarium. 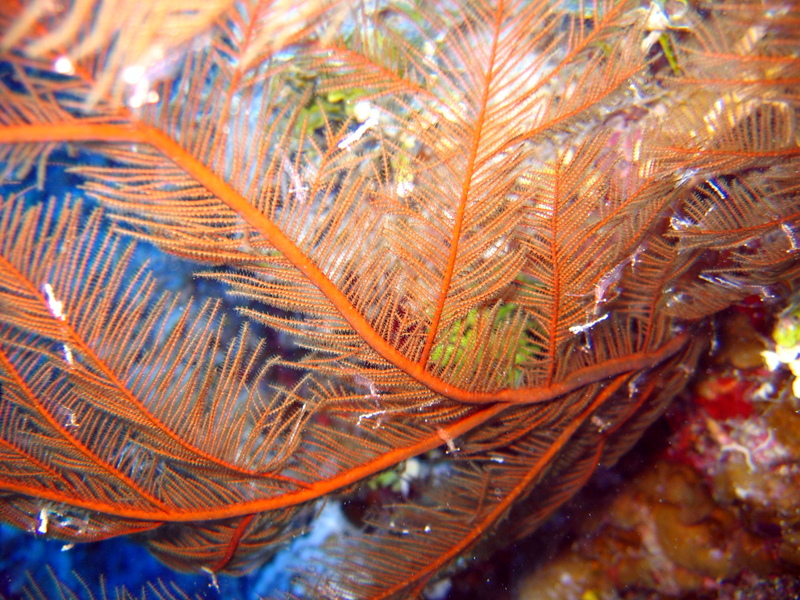 What Caribbean biotope would be complete without an appearance from the orange sun coral? These bright orange colonies come to life when their yellow polyps extend. While orange sun corals are highly desirable, they too are non-photosynthetic and require subdued lighting and constant feedings. One interesting side note, this coral species is easily spawned in the aquarium. 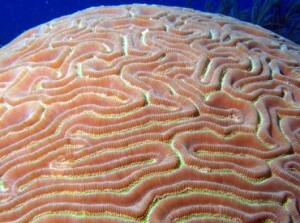 Daily, the sun coral releases spawn, which appear as tiny orange specks. These can be placed in a very small aquarium with only live rock. As the spawn settles, it begins to grow a colony of its own. While it’s labor intensive and time consuming, this is a great introduction into coral spawning. While these are just a handful of species from a very rich ecosystem, there are some notes to remember if you seek to establish your own slice of the Caribbean. First, much of the live sand and live rock harvested for the hobby, comes from the Caribbean. If your goal is a true biotope, where everything down to the copepods originate in one specific area, then it’s easy to find stuff naturally harvested from regions like the Bahamas. 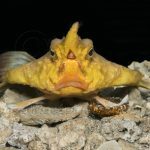 Since many species of fish that hail from this region either grow large, or have a few special captive considerations, a Caribbean biotope isn’t for a novice aquarist. To make matters more challenging, many of the coral species from this area are non-photosynthetic, and a Caribbean reef isn’t complete without copious amounts of sponge and sea squirts, all of which are demanding to keep healthy. I often recommend Caribbean biotopes to aquarists seeking an all-natural reproduction of a specific ecosystem. There is enough diversity in the Caribbean to make for an interesting display, but not so much that you’re overwhelmed. With the right size tank, and an eye for details, a very attractive and unique Caribbean biotope is within your reach.